Flaxseed oil can be found in liquid form or in a gel-capsule form. It is a source of essential fatty acids, which promote good hair health. People who want to supplement with flaxseed to promote healthy, shiny hair can use one to two tablespoons daily in salad dressing or mixed into foods such as smoothies. Alternatively, a person could take one to two capsules daily. 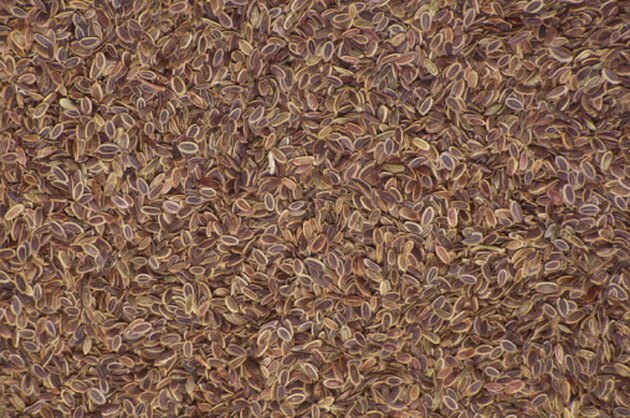 Flaxseed oil is a source of the essential fatty acid (EFA) named alpha linolenic acid, or ALA. Such EFAs are important to hair and skin health. People who lack these often have trouble growing their hair. Dry, brittle hair and hair loss are signs of an EFA deficiency, advises nationally known nutritionist Ann Louise Gittleman, author of "Super Nutrition for Women." EFAs are called "essential" because people are unable to create them in the body, but body cells need to use them every day. In fact, EFAs help form the structure of every cell in the body, including hair cells, according to nutritionist Rudy Silva, an adviser for HealthGuidance.org and the Better Natural Remedies newsletter. The ALA in flaxseed oil can help inhibit the enzyme called 5 alpha reductase, which converts testosterone into the male hormone dihydrotestosterone (DHT). DHT is a male hormone, or androgen, that shrinks hair follicles, according to the Mayo Clinic. It's an large factor in pattern baldness. ALA, Gamma Linolenic Acid (GLA), and Oleic Acid all inhibit 5-Alpha reductase and are used as natural remedies for hair loss as well as in commercial formulations that promise to halt hair loss, according to Hair Loss Information. Flaxseed oil's ALA is an omega-3 fatty acid, which may halt hair loss due to stress and spark regrowth. Supplementing with omega-3 fatty acids can reduce stress and the effects of stress on the body, says the University of Maryland Medical Center. Telogen effluvium is the most common type of hair loss caused by stress. In this condition, stress causes large numbers of growing hairs to go into their resting phase, advises the Mayo Clinic. Within a few months, affected hairs fall out. Hair typically grows back when the stress is addressed. Adding omega-3 fatty acids such as those in flaxseed oil to topical corticosteroids or to the etretinate drug therapy can help improve symptoms of psoriasis, including hair loss, according to UM Medical Center. People recover from psoriasis-related hair loss and are able to regrow their hair when the skin condition is controlled, advises the New Zealand Dermatological Society. Flaxseed oil's ALA will not work for everyone who wants to promote hair growth. The ALA in flaxseed is converted to docosahexaenoic acid (DHA) as well as eicosapentaenoic acid (EPA) and in the body, according to UM Medical Center. DHA and EPA break down further into prostaglandins, which give cells information on how to function and also reduce inflammation in the body. Some people don't have enough of the enzymes that help to convert ALA into DHA and EPA. Such people need to supplement with fish oil instead of flaxseed oil because fish oil already has DHA and EPA. Also, poor eating and health habits can impact flaxseed oil's conversion into DHA and EPA, such as eating too much sugar, too many carbohydrates, smoking and drinking too much alcohol and caffeine, advises Hair Loss Information. People who have diabetes or schizophrenia often lack the ability to convert ALA, according to UM Medical Center. A person who suspects he lacks the enzyme needed for the conversion process needs a blood test to find out. People who want to supplement with flaxseed oil need to purchase supplements that are made by reputable companies. The companies should certify that their supplements do not contain heavy metals like mercury or lead, says the UM Medical Center. Timing is important, too. Flaxseed can slow the absorption of other nutrients important to hair health or of oral medications when taken at the same time, so it should be taken separately. Flaxseed oil also can interact with blood-thinning medications as well as blood-sugar-lowering medications.